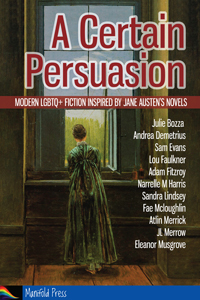 Blurb: Thirteen stories from eleven authors, exploring the world of Jane Austen and celebrating her influence on ours. Click here for the blurbs, and here for the reviews. I had three or four ideas about what to write for A Certain Persuasion. 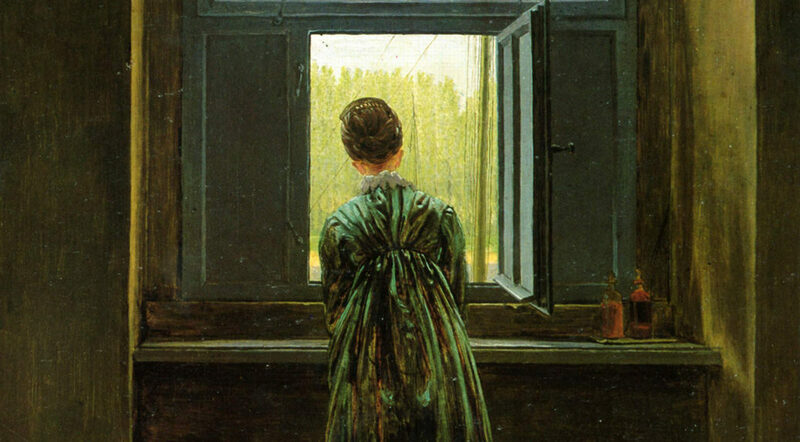 However, my contribution came from one of the notions I came up with initially as possible inspiration for other authors, that went into the Call for Submissions: “What if Elinor Dashwood was repressing her love not for Edward but for a woman?” It was an idea that stuck with me – and as I re-read Sense and Sensibility with my editor’s hat on, the decision was made as I realised how very much I love and identify with Elinor. I like that she’s sensible and responsible, and takes things such as promises seriously. But I like that she also has a full emotional life going on in there, even if she chooses to keep it to herself most of the time. We see it, however, when she and Marianne finally have the whole horrible truth confirmed by Willoughby’s last letter to Marianne – Elinor promptly lies down on the bed beside Marianne and bursts into tears just as passionate as Marianne’s. We see it after her brother John Dashwood leaves Mrs Jennings’ house after talking to them about Edward’s engagement to Lucy – Mrs Jennings, Elinor and Marianne are horrified at how heartless the Ferrars family are being, and the three of them have a righteously satisfying vent about it. Elinor judges to a nicety when such things are appropriate and when they’re not. Maybe I should say I ‘aspire to be’ Elinor rather than ‘identify with’, because heaven knows I get such things wrong at least half of the time! Anyway! This became the story Elinor and Ada. 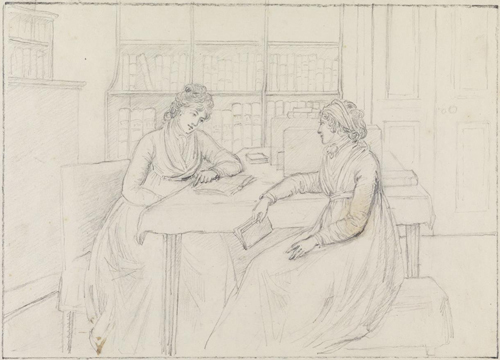 Of course Emma Thompson and Hattie Morahan each had an effect on my portrayal of Elinor, but my main source of inspiration was the following sketch of Anne Seymour Damer and Mary Berry. Other writers no doubt do the same: I like to have a visual that captures something of what I want to achieve in a story, and I display it on one screen while I write in the other. This sketch was certainly it for me!